Most of us have used a Web-based e-mail service to check our inboxes. But such services aren’t the only Web-based applications out there—others offer credible alternatives to iPhoto, iSync, and even (for reading RSS feeds and maintaining lists of bookmarks) Safari itself. No, using a Web-based application isn’t the same as using a native Mac app. But Web programs do have one distinct advantage: they’re available from any computer connected to the Net, whether that system (Mac or PC) is at a friend’s house, an office, or an Internet café. And your files are available, too: imagine that you’ve bookmarked a Web page on your home Mac, and you find yourself stuck at the office, unable to remember that URL. If you’d stored it using a Web-based bookmark app, you could just log in and find it. If you own more than one Mac, Web-based apps are an inexpensive, easy way to keep your information in sync. The more you migrate your programs and data to the Web, the less you’ll depend on any one computer. And Web apps offer a bonus: the best of them can help you find out what other users are doing with similar information. They add a social dimension to computing that stand-alone Macs just can’t match. )—that takes online bookmarking to a whole new level. More Than a Spider Instead of relying on mechanical search engines, del.icio.us uses tags applied by real human beings to find relevant Web links. The difference between del.icio.us and .Mac’s bookmark syncing seems minor at first: del.icio.us lets you assign one or more keyword tags to each bookmark. But those tags are the crux of the app. In addition to helping you organize your own favorite links, they can help you find the favorites of other del.icio.us users.
. So instead of having a mechanical search engine spit out a list of sites with the word Apple or Mac in their text, you can let other human beings tell you which sites they think are relevant. These social connections go deeper still: when you add a bookmark to del.icio.us, it will tell you how many other users bookmarked the same page. It will also allow you to flip through their link collections. Find a user who shares your interests, and you’re sure to find plenty of new and interesting Web sites. At the moment, you can’t import bookmarks into del.icio.us as simply as you can into .Mac and iSync. But a del.icio.us bookmarklet is available for Safari, Mozilla’s Firefox, Opera Software’s Opera, and Microsoft’s Internet Explorer (see del.icio.us/doc/about for details). After you’ve installed it, you can click on it to add the current Web page to your del.icio.us collection. While the spartan, no-nonsense design of the del.icio.us Web site keeps things running fast, Mac users accustomed to a more polished interface should test-drive Sci-Fi Hi-Fi’s Cocoalicious (free). 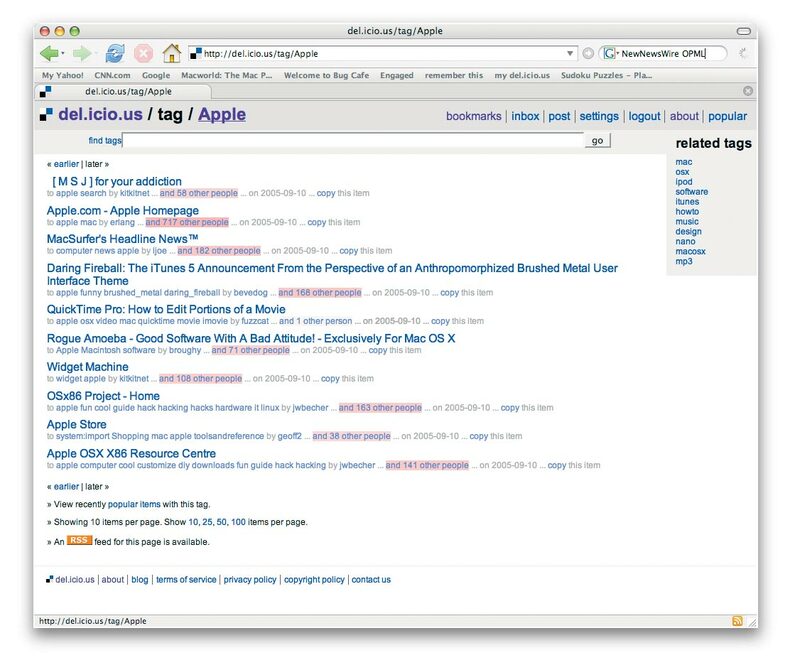 The Mac-only Cocoalicious puts an iTunes-esque front end on the del.icio.us engine, making bookmark organization even simpler. RSS fans, take note: if you use Ranchero Software’s NetNewsWire or NetNewsWire Lite to read your RSS feeds, go to the program’s Preferences menu, click on the Weblog Editor button, and select Cocoalicious from the drop-down menu. 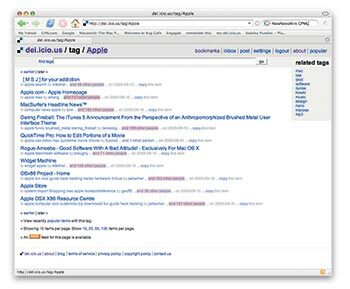 The next time you come across a good link in one of your RSS feeds, click on the Post To Weblog button at the top of the NetNewsWire Lite window to send the URL to Cocoalicious and, from there, to your fellow del.icio.us users. Speaking of RSS: having a customized stream of Web news delivered directly to your Mac is undeniably convenient. Thanks to Safari’s built-in RSS support in OS X Tiger, more Mac users are collecting and reading RSS feeds than ever before. One big reason RSS is so popular is that it makes keeping track of which stories you’ve read and which you haven’t easy. Once you’ve read a story, it’s marked as read. But what if you’re a mobile user who hops from computer to computer? Your RSS reader can’t keep up with where you’ve been or what you’ve read. Browsing RSS feeds on the Web eliminates that headache—and has a few other benefits. RSS on the Road Even if you’re away from your Mac, you can use Bloglines to keep up-to-date on all your RSS feeds—and you can import them from your current RSS reader. 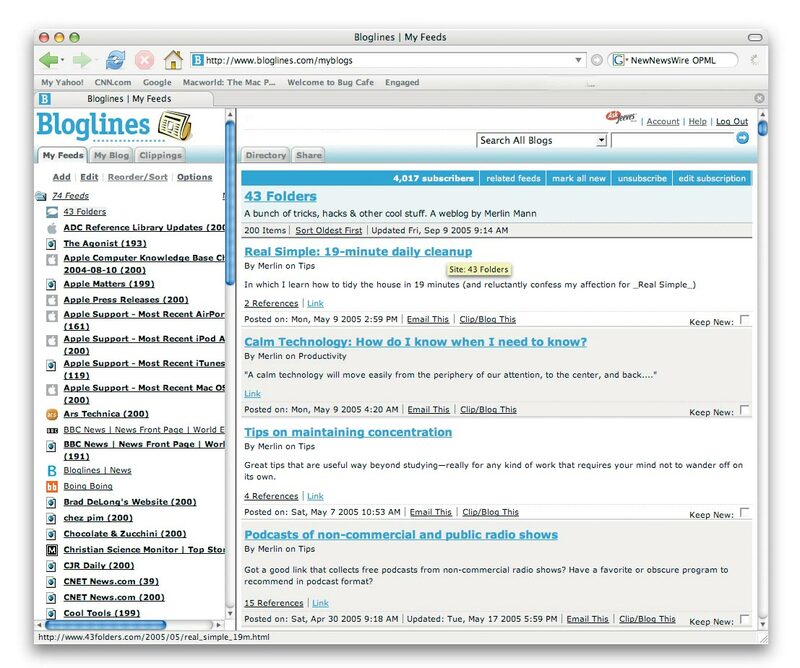 Bloglines is one of the best online RSS tools around, and it’s free. It lets you follow your favorite news feeds within a two-panel interface similar to that of stand-alone RSS readers. While you can subscribe to feeds directly, Bloglines also makes it simple to import feeds from your current news reader—as long as your RSS reader exports data in the OPML format. In NetNewsWire Lite, for example, you go to File: Export Subscriptions, select a name and destination for your export file, and choose a format for the export—OPML (With Groups) will preserve whatever groupings you’ve created to organize your feeds. Then click on Save. 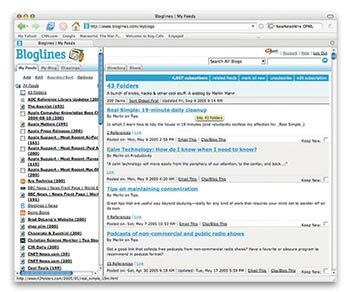 Like del.icio.us, Bloglines is more than just a convenient way to access an application when you’re away from your Mac. It, too, has a social aspect to it. It will point out the day’s most-linked-to topics on the Web. It’ll also let you share your subscriptions with other people and allow you to check out feeds other users are subscribed to and the Web sites they enjoy. Again, chances are you’ll stumble across something good. While the photo-sharing site Flickr doesn’t let you edit your photos the way iPhoto does, it can help you organize, save, and share even the heftiest photo collection. In fact, Flickr is better than iPhoto in a couple of ways. First of all, because it’s Web-based, multiple users can share a single account (a basic one is free). That makes it easy to trade and organize photos between, say, the family G5 at home and an iBook in a faraway dorm. Second, like del.icio.us and Bloglines, Flickr is inherently social, thanks to keyword tagging. For families sharing a Flickr collection, tags are an easy way to find photos featuring, say, baby visiting grandma. If you make a picture public, other Flickr users can search against your tags, comment on your pictures, or even add tags of their own. Why would you want to search someone else’s snapshots? Say you’re planning a trip to Rome. You could go to Flickr, search for the tag Rome, and get some ideas for sites you might want to see. Even better, you might get some travel tips in the attached comments. That’s what makes Flickr so much more than a way to share snapshots. Another way to quickly add a photo to Flickr is the Flidget Dashboard widget for Tiger (free). It provides just enough of an interface for you to tag your photos and set their privacy level. That integration between iPhoto and Flickr is how things should work: you can let your desktop apps do what they do best, while Web apps make your data available wherever you are, even if you’re away from your Mac. Until we realize the dream of truly ubiquitous computing, Web apps will have to do.